Modernize is your trusted source when you are looking for replacement windows in Jacksonville, FL. Our reliable contractors can help you fix any problems you're having with your home's windows. You can enjoy a more energy efficient home by upgrading, repairing, or restoring your windows today! Get free quotes from the best window replacement contractors in Jacksonville, FL, ready to complete your project. Improving your Jacksonville property by replacing or installing new windows has many benefits: increased property value; greater energy efficiency; improved operation and comfort levels; and, boosting the aesthetic appeal of your home. Few things can drag down the value and curb appeal of your home more than old, broken windows. Windows are a major component of a home or property and are often one of the first things visitors and prospective home buyers notice. Regardless of your reasons for replacing them, installing new windows will enhance your everyday life as well as provide an excellent marketing tool should you ever decide to sell your property. Before purchasing new windows in Jacksonville, Florida, take into account the following factors applicable to your region. After deciding on a window frame material that meets your needs, consider the type or style of window you want for your property. There are many styles of windows available with different operating factors. Since windows are designed to last many years, it is beneficial to do your research and find the type best suited for your application. Jacksonville residents have many decisions to make when purchasing new windows. Many window supply companies are located in the Jacksonville area, including the big home improvement centers. All offer the latest in widow design and efficiency with multiple selections from a large field of manufacturers. Now that you have chosen a frame, window style and supplier, the next step is obtaining a construction or building permit from the City of Jacksonville before starting your window installation. Homeowners who choose to install their own windows can obtain a permit for construction through the City of Jacksonville. Homeowner permits are not allowed for rental properties or properties for sale. All others circumstances require a licensed and state certified contractor. All construction activity within the State of Florida must adhere to the Florida Building Code. The State of Florida requires that all residential and building contractors operating within the state carry liability and workers compensation insurance. They are also required to undergo continuing education classes annually to maintain their contractor privileges. You can verify the status of their license by visiting www.MyFlorida.com, the official portal of the State of Florida. 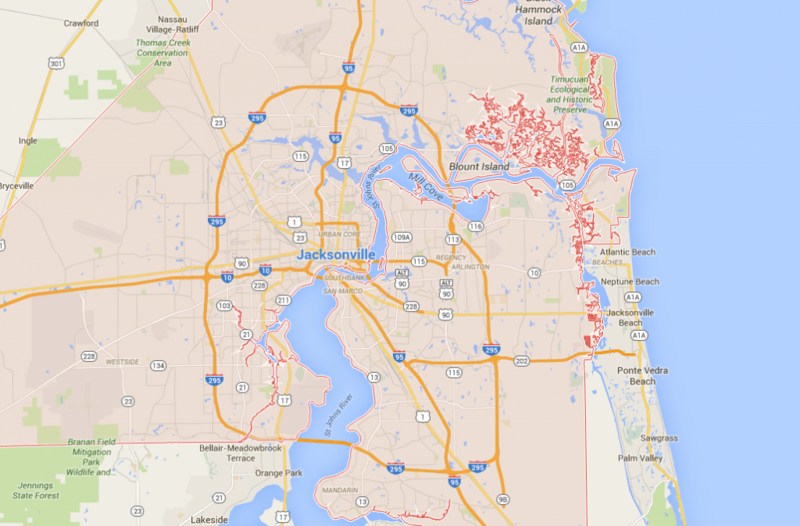 Jacksonville is a coastal city that lies on the Atlantic Ocean. The region experiences periods of heavy rainfall often through afternoon thunderstorms. Jacksonville’s climate, (like most of Florida’s) falls between sub-tropical and tropical. Jacksonville residents experience hot, humid summers with mild to moderate winters. Due to their close proximity to the ocean, exposure to ocean breezes and the salty air is year round. Since these climate conditions can be harsh on certain types of building materials, it would be wise to consider a window frame material capable of standing up to these elements. Vinyl is a tough, plastic-like material that is ideal for Florida climate conditions. Its versatility and durability have made it the most popular window frame material in Florida. It never needs painting, does not chip, peel or fade, and once installed, is virtually maintenance free. Fiberglass framed windows are also an ideal choice for the tropical conditions Florida residents experience. Manufacturers mix fiberglass with the plastic vinyl to create a more rigid frame for applications where flexibility is not desirable. Another attribute of a fiberglass-vinyl frame is that it will hold paint. This provides a valuable option for Jacksonville property owners who want to maintain a clean, new appearance or simply want custom colored window frames. Wood has been used for window frame construction for centuries. Popular species of wood used for frames includes pine, fir, mahogany and alder. Nothing compares to the beauty a wood-framed window brings to a homes interior. The wood grains specific to each species offer a unique appearance. However, wood is the most expensive, does not hold up well in tropical or sub tropical climates; and, it requires periodic maintenance to prevent damage. Wood clad windows provide natural beauty to the interior with the durability required for outside weather by covering the frame exterior with aluminum, fiberglass or vinyl. Although the cladding will increase the cost of the windows, it provides a tough armor that will help protect your investment.